President Muhammadu Buhari obviously has enormous emotional investment in his perception in the media— broadly conceived. His first appointments upon being sworn in as president were media appointments. At the last count, he has at least six media advisers and assistants. 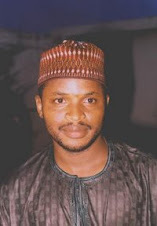 He has a Special Adviser on Media and Publicity (Femi Adesina), a Senior Special Assistant on Media and Publicity (Malam Garba Shehu), a Special Assistant on Digital and New Media (Tolu Ogunlesi), a Personal Assistant on Broadcast Media (Shaaban Ibrahim Sharada), and a Personal Assistant on New Media (Bashir Ahmad). Last week, he added to the list by appointing another Personal Assistant on Social Media by the name of Lauretta Onochie. That has got to be a world record! I teach and research new media for a living, and know for a fact that "social media" is just a component, the most significant component these days, of "new media," which is synonymous with "digital" or "emerging" media. So it's not bad enough that the president has two people "advising" and "specially assisting" him on “media and publicity” and another person “specially assisting” him on “broadcast media”; he also now has three people "specially" and "personally" "assisting" him on exactly the same thing: new/digital/social media! Trust Buhari’s gaggle of low-wattage, self-appointed social media defenders to justify even the weirdest and wildest policies his administration churns out. They said new media is vast and varied, and deserves to have a multiplicity of people to effectively handle it for the president. The PA on New Media, they say, monitors Twitter for the president, and that the new PA on Social Media will devote exclusive attention to Facebook on behalf of the president! Well, how about the SA on Digital and New Media? What does he do? Perhaps he supervises—or will supervise— both PAs. And, maybe, the SA and SSA on Media and Publicity, though active participants on Twitter and Facebook dialogic exchanges, don’t count since they aren’t digital natives, as we call people who came of age in the last two decades or so. I have a better idea for the president since he wants to cover all his media planks. You see, “emerging media” is a modern, trendy synonym for “new media” and “digital media.” Another personal assistant should be appointed and called “Personal Assistant to the President on Emerging Media.” If people scoff at the appointment, as they are doing at the latest one, the president or his unpaid social media automatons can justify it by saying the president needs someone to monitor emergent, newfangled social media platforms like Instagram and Snapchat to which a new generation of Nigerians is now migrating. What better person to do that than a PA on “Emerging Media”? But there is an even better idea. The president should appoint another PA called “Personal Assistant to the President on Declining Media.” You see, there are social media platforms like MySpace that are declining but that are significant nonetheless. Although only a minuscule percentage of Nigerians congregate in these declining social media platforms, our president can’t afford to ignore them completely because they could bounce back. Even if they don’t, who cares? So the president does need an SSA on International Media to take on these “racist” (apologies to Lai Mohammed) international media that think they can expose our president’s double standards without consequences. This is frankly disquieting on so many levels. But I have read people justify these ridiculous appointments by saying although former President Jonathan had only three media aides, he did worse in other appointments. This contrast is wrong for many reasons. Is Jonathan now the baseline by which to measure Buhari's performance? Haven't we (those of us who supported Buhari's emergence, that is) agreed that Jonathan was an irredeemable disaster? 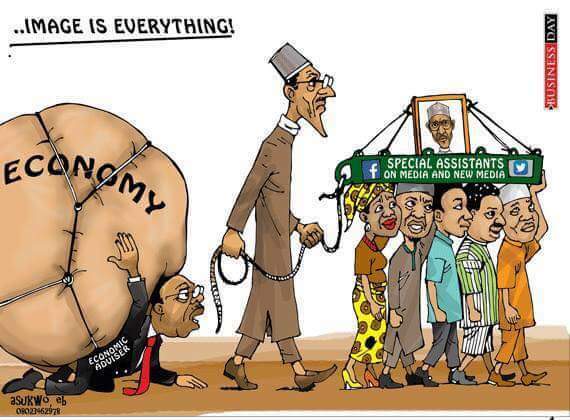 What does it say of Buhari (who promised "change") that he is now being compared with Jonathan? What does it say about Buhari that he is now perpetually being compared and contrasted with the lowest common denominators in governance? The other day his supporters defended his unprecedented decision to take his wife and daughters to the UN General Assembly by citing the example of irascible Belarusian dictator Alexander Lukashenko who took his then 11-year-old son (that he is grooming to take over from him) to the UN. Do the president’s defenders realize that they are admitting that their idol has failed if the only defense they can give of his policies is that some tyrant or universally incompetent leader somewhere sometime did them too? Additionally, Buhari was sold to Nigerians as an uncommonly modest and austere man who would lead by example, who would crack down on corruption, who would eliminate waste, etc. Does the appointment of six aides to do basically the same job square with that image? I leave that to your judgment. Finally, this is a time of excruciating recession when millions vegetate in the nadir of suffering and hopelessness and when the government has the cheek to exhort distraught and economically disaffiliated people to "sacrifice" and let "change” begin with a deliberately amorphous, ill-defined “me." The big question is: Does the “me” exclude the president? But the bigger question is: Is the president aware of the English saying that “Too many cooks spoil the broth”? Well, let’s see how the president’s six media cooks will make his media perception broth.